This is Dallas. 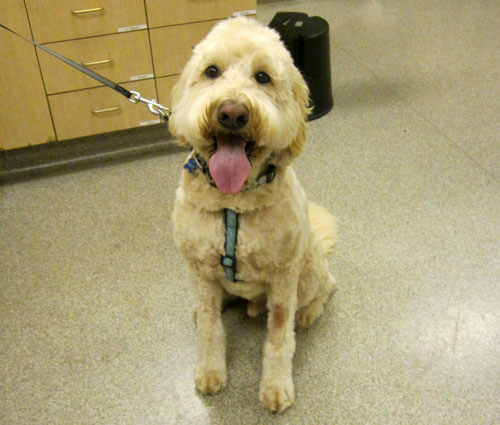 Dallas is a 7 year old labradoodle that has been coming here since he was a puppy. We recently saw Dallas after his owners noticed that he seemed to be feeling a little under the weather and was more lethargic than normal. A physical exam and radiographs revealed that Dallas had a fever and a mass on his right side just below his rib cage that extended into his abdomen. An abdominal ultrasound and fine needle biopsy confirmed that the tumor was malignant. Surgery was performed and a CT scan was then done to make sure that the tumor had not spread. The tumor was completely removed, but with very small “margins” or normal tissue at the edge of the abnormal tissue. Dallas is currently undergoing chemotherapy to prevent spread of the original tumor. He continues to be a wonderful and happy patient which is why we would like to congratulate him on being this month’s Pet of the Month.